How to Apply for TS DEECET 2019, Submit Online application form till April 15 at deecet.cdse.telangana.gov.in. How to fill the TS DEECET Online application form, TS DEECET Application Fee. Online applying procedure for TS DEECET. Inviting applications for D.El.Ed. (Diploma in Elementary Education) and D.P.S.E. (Diploma in Pre-School Education) through DEECET 2019 through computer based test (online mode) for admission into two year course in Govt. DIETs / Private un-aided Elementary Teacher Education Institutions (including Minority and Non- Minority) in the State of Telangana for the Batch 2019-2020. For further details, the candidates are requested to visit http://deecet.cdse.telangana.gov.in the information bulletin from 11-03-2019 onwards and online applications can be submitted from 11-03-2019 to 15-04-2019. 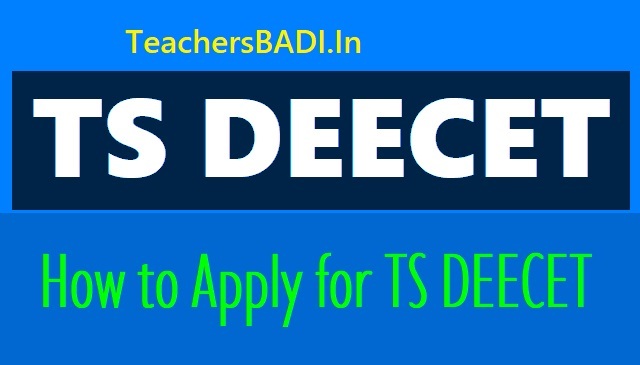 The last date to apply online for TS DEECET 2019 is April 15, 2019. The State Council of Educational Research and Training (SCERT), Telangana, has invited candidates to apply for Diploma in Elementary Education Common Entrance Test (DEECET) 2019. The online application process has started from March 11 and the candidates can apply till April 15. The last date to pay application fees is April 15, 2019. The date for the examination will be notified later. The papers will be conducted by the District Institutes of Education and Training (DIETs) of Mahabubnagar, Vikarabad, Hyderabad, Havelighanapur, Nizamabad, Adilabad, Karimnagar, Warangal and Nalgonda. The date, time and venue for each candidate will be available on the candidates’ admit cards. The TS DEECET exams will be held in Telugu, English and Urdu mediums for 100 marks. Candidates will be asked questions on general knowledge, general English, general Urdu/Telugu, mathematics, physical sciences, biological studies and social sciences. Meanwhile, the Board of Secondary Education, Telangana has released the admit card for the SSC (Class 10) examinations this week. The candidates who will appear in the examinations can download the admit card from the official website — bsetelangana.org. The SSC examinations will be held from March 16 to April 2, 2019. Last date to apply online: April 15, 2019. (1).The candidate should have passed or appeared for the Intermediate Examination (Qualifying Exam) or its equivalent as decided by the DEECET Committee for appearing at the DEECET. However, she / he should have passed the qualifying examination by the time of admission. (2).The candidates should have secured 50% of marks in aggregate in the Qualifying Examination for appearing at the DEECET. The minimum percentage of marks in the case of Scheduled Castes and Scheduled Tribes and Physically Challenged candidates shall however be 45%. The candidates who passed Intermediate with Vocational Courses are not eligible for appearing at DEECET. (3).Candidates should have completed 17 years of age as on 1st September of the year of admission. There shall be no upper age limit for admission into D.El.Ed Programme. Step 1: Application Fee Payment: Candidate can make Online Fee Payment through this option. candidate should fill in the Application through this option. The fee towards submission of application online and for appearing at the TSDEECET 2019 online is Rs.413/-. Candidates shall pay the fee through the Payment Gateway provided on http://deecet.cdse.telangana.gov.in from 11-03-2019 and submit online application at the TSDEECET website from 11-03-2019.
i. The candidates shall first download the 'Information Bulletin' free of cost from the website ://deacet.cdse.telangana.govin go through it carefully and satisfy their eligibility for appearing for DEECET, 2019.
ii. The candidate after satisfying herself/himself about the eligibility criteria for DEECET, 2019 shall pay a fee of Rs.413/- through TSONLINE midnight [or submission of application Online. At the LPCET website Centers, the candidate has to give the required preliminary data (i.e. Name of the candidate, Date of birth, Gender and mobile phone number). On receipt of fee at DEECET, 2019 website the candidate shall be issued a 'Payment Reference ID' with which she/he can proceed with submission of application online. Issue of Payment Reference ID does not mean that the candidate has completed submission of application online. It is only a confirmation of the fee received. 6. Download of Hall Tickets: April 2nd week.